Lionel Messi struck twice as Barcelona inflicted more Champions League pain on Tottenham Hotspur with a 4-2 win at Wembley on Wednesday. 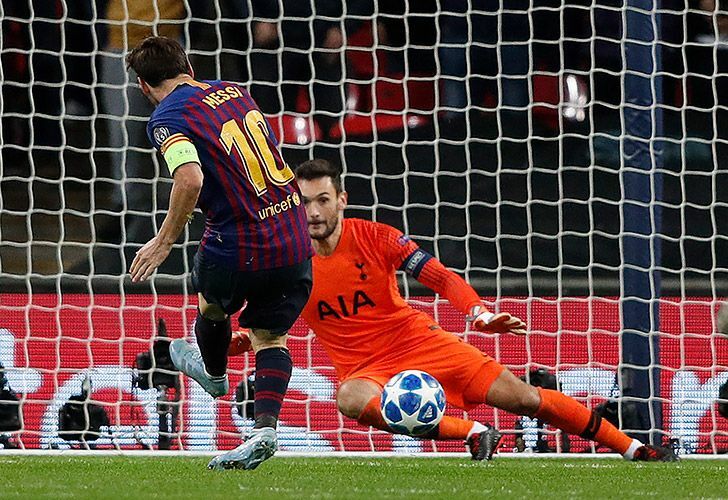 Lionel Messi struck twice as Barcelona inflicted more Champions League pain on Tottenham Hotspur with a 4-2 win at Wembley on Wednesday, while Neymar hit a brilliant hat-trick in Paris Saint-Germain's 6-1 rout of Red Star Belgrade. Messi, who had earlier twice hit the post, then got on the scoresheet in between goals from Harry Kane and Erik Lamela, before the Argentina captain grabbed his second late on to seal victory. "He's a fantastic player," said the Argentine coach. "His average performance is this type of game. He's always above everything." Pochettino admitted Tottenham had only themselves to blame for Lionel Messi's mesmerising masterclass. Spurs found it impossible to subdue Messi as Barcelona ended their three-match winless streak in emphatic style. Messi's brace was just reward for an irresistible display from the Argentina legend. He already has five goals in the Champions League this season after hitting a hat-trick against PSV Eindhoven in Barcelona's group opener. Coutinho described playing alongside Messi as an "honour" as Barca again came away from Wembley with happy memories, having won the European Cup twice at the home of English football in 1992 and 2011. "Everything Messi does on the field is unpredictable," said the Brazilian. "To play with him is an honour. He's always doing something new." "Messi doesn't surprise me. We conceded the first goal and it is very difficult because that sets the game. We paid for that," Pochettino said. "We had to give spaces when we were looking for a result. What happens is players like him can finish you off. "After 45 minutes we didn't concede one chance to Messi. Of course in the second half when it's 2-0 and you give more space, it's so difficult to stop this type of player. He is the best in the world. With a lot of space it is unbelievable how he runs and dribbles. In the second half he was decisive. He's got that capacity and hunger for scoring," said Pochettino. The Spurs coach was frustrated that his side gifted the initiative to Barca so easily, but he took heart from the way they pushed their star-studded opponents harder in the second half. "Against a team that needed to win, to concede after two minutes, it destroyed the plan," Pochettino said. "After making those mistakes, the first half was difficult for the team to be confident and play the way we planned. It's hard to assess the game. When you play a team like Barcelona you cannot afford to concede these type of chances. "But for me, most important was the second half. We did everything to come back. We showed character and I'm so proud of the players." Tottenham's hopes of qualifying for the last 16 from Group B are now in grave danger after two successive defeats. Having lost to Inter Milan and Barcelona, Pochettino knows Tottenham must win their next European fixture at PSV Eindhoven later in October. "We still need to play four games. We are going to have it in our hands to be in the next stage," he said. "Of course it will be tough because now there are must-win games." After three La Liga games without a win, including a shock loss to lowly Leganes, this was a morale-boosting success for Barcelona. Another setback would have added to the sudden sense of crisis around the club. Valverde admitted he was pleased with his side's stylish response to their recent woes. "It's true that after a few bad results it was very important to do well today and we responded very well," he said. "We want to always dominate and we did. Our response was very strong and effective. It was a great game against a difficult team." Valverde was especially impressed with the way Barca stood up to late Tottenham pressure. "The game was very intense. When it was 3-2, Tottenham made it very difficult for us," he added. "We had a few problems in the game but we solved them and we just want to continue like this. I'm very happy with the players. Today's game was key for us." Carlo Ancelotti's Napoli top Group C on four points after Lorenzo Insigne delivered a 90th-minute winner at home to Liverpool, who are level on three alongside PSG. Dries Mertens hit the bar for Napoli late on, but there was still time for Insigne to nick all three points at the death as he slid to poke in a cross from Jose Callejon. "Tonight we showed this group won't just be hard for Napoli, but for everyone involved," said Ancelotti. "It means a lot to us to have won against the finalists from last year." Antoine Griezmann scored two goals to lift Atlético Madrid, last season's Europa League winners, to a 3-1 victory over Club Brugge in Spain. "I said it last season and I'll say it again – Griezmann is the best player in the world," said Atlético coach Diego Simeone.